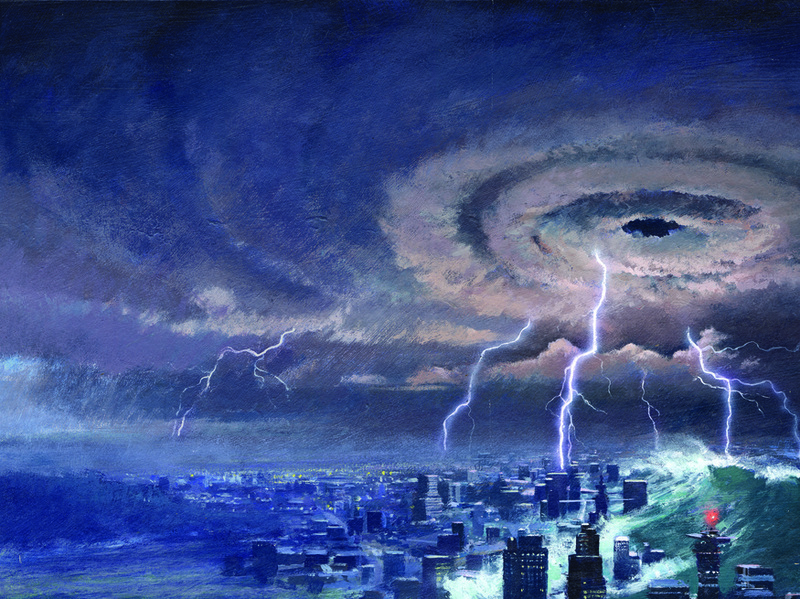 Sense and the City explores how the future of London was imagined in the past, and how new technologies are influencing transport, entertainment, communication and news. 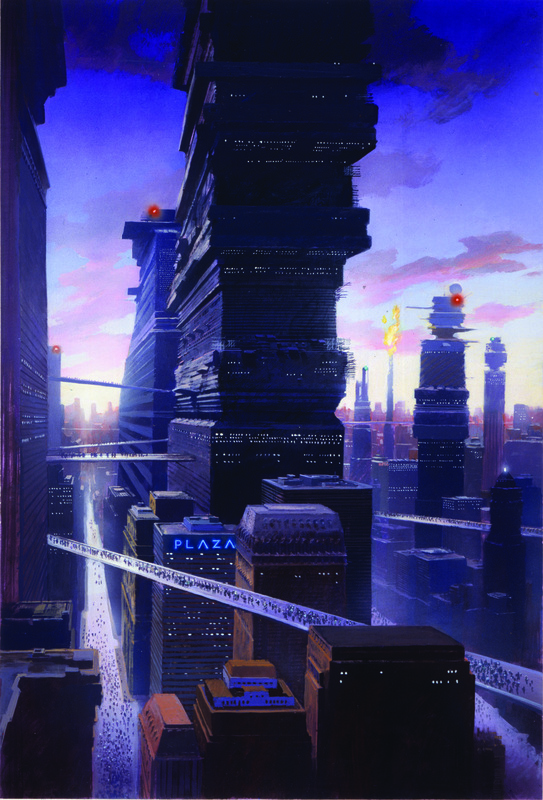 The Architectural Utopias section offers striking visions of future cities. 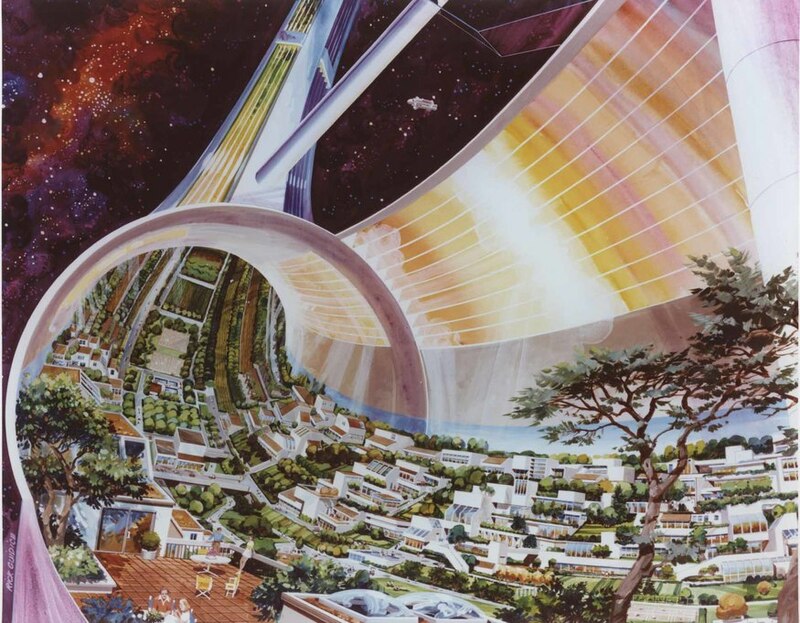 NASA’s Toroidal Colonies from 1975 and John Harris’ Body Mortgage illustration particularly stand out, while Future Nightmares shows how it could all go so horribly wrong. Ever wished your bus or taxi could take to the air and skim over a traffic jam? 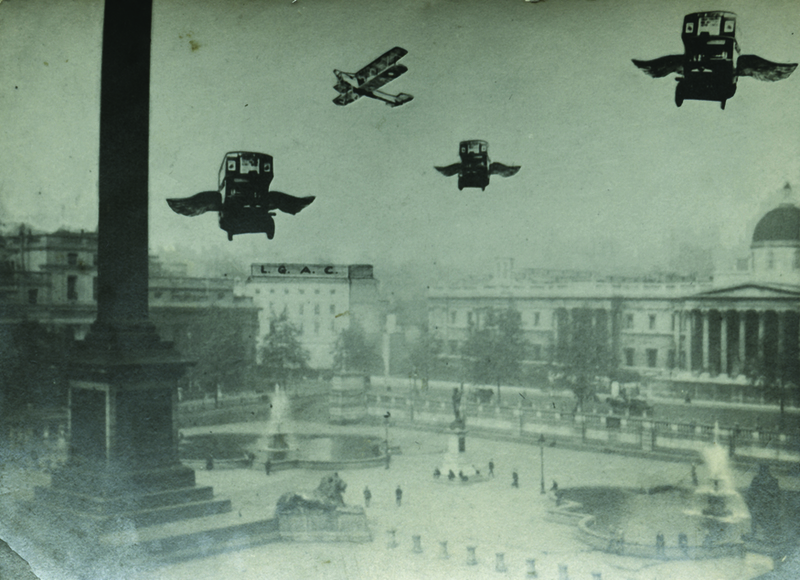 Sadly, Future Satires’ flying buses exist only in London General Omnibus’ archives for the 1920s. Even in the 1960s, people dreamed of automatic trains – Arthur Radebaugh’s Robot Railroading is an eerily accurate premonition of the DLR. Personal transport is a recurring theme – Syd Mead’s (visual futurist of Bladerunner and Tron fame) uni-pods enclose the wearer in ‘a carapace with a pair of mercury gyros on the back that would serve as a personal mobility device.’ If anyone can explain to us what that means, please be our guest in the comments. On this theme, the ill-fated Sinclair C5 is featured along with the slightly more bizarre RYNO – a self-balancing, one-wheeled, electric scooter. 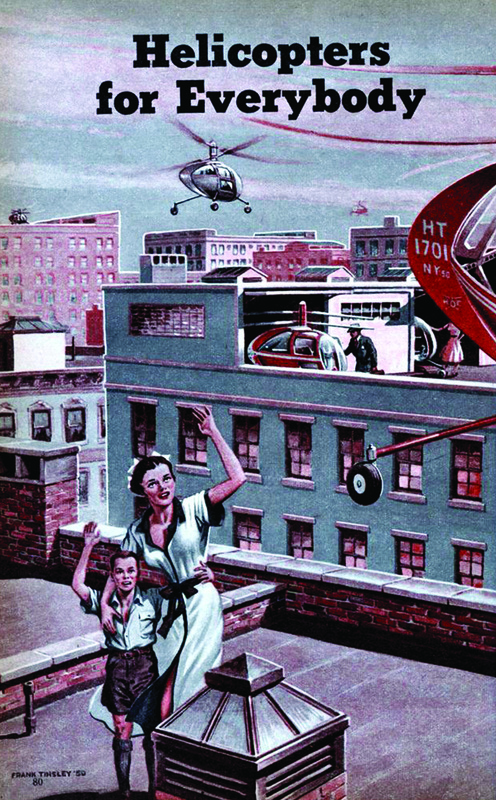 We really wish Helicopters for Everybody had come to fruition, though. 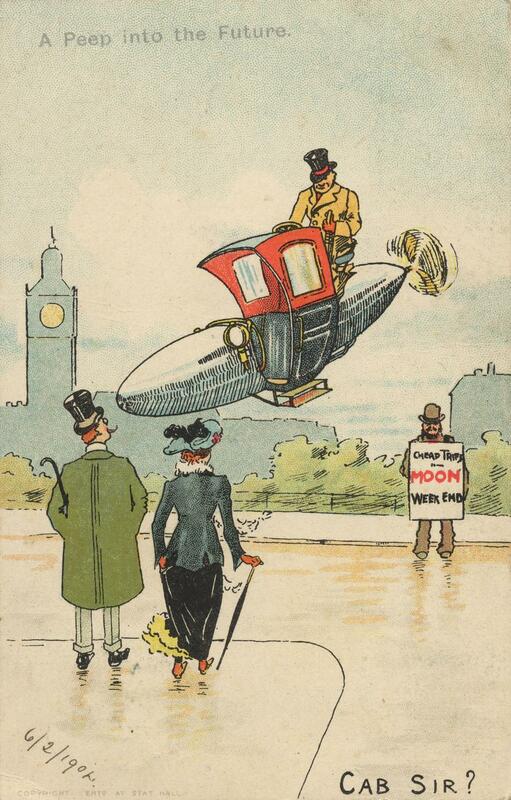 One of the LTM’s key partners, the Royal College of Art, presents some new ideas on future technology and transport, some perhaps more useful than others. The emotion scooter, which uses the rider’s body expressions and mood to communicate with other road users could have some worrying implications for road rage. BikeHub, however, is a useful app which aims to help cyclists find routes away from busy roads and offers 3D maps and satnav. Augmented Wayfinding could help pedestrians discover their boroughs dynamically using social networking. The centerpiece of the exhibition is an interactive table with eight screens where the viewer can see animations, maps and images of subjects ranging from geotagging to driverless cars. For the tinfoil-hatted, there’s a slightly worrying display from artist Manu Luksch on the prevalence of CCTV in London, complete with a map of all the camera locations in Whitehall. A display on Automatic Number Plate Recognition (ANPR) and face recognition technology demonstrates that no-one is faceless in a crowd. Finally, the Bus Shelter of the Future shows us how waiting for the new Boris bus could be so much better. it doesn’t just keep one’s hair dry in the rain, it also provides travel data in real time, alternative route suggestions and touch screens. And it doesn’t have a gang of 14 year old hoodies drinking cider in it. The Sense and the City exhibition opens on Friday 1 July and runs until 18 March 2012 at London Transport Museum, Covent Garden Piazza, London, WC2E 7BB. Executive Curator, Stephen Feber, StephenFeber@me.com, 07515 338535. Admission is included in the entry ticket to the main Museum galleries (adult admission charged and under16s free). For further information visit www.ltmuseum.co.uk or call 020 7565 7298.